When most coaches ponder their ideal season opener, they’re aiming for little more than a respectable showing – best case scenario, light on nerves and errors; worst case, at least something from which the program can learn. Winning a 16-team tournament loaded down with some of the top teams in the state – many from a classification above their own – would usually be considered hoping a little too high. But Lady Bulldog softball head coach Sandra Pulido and her staff got exactly that from their 2018 Lady ‘Dogs. 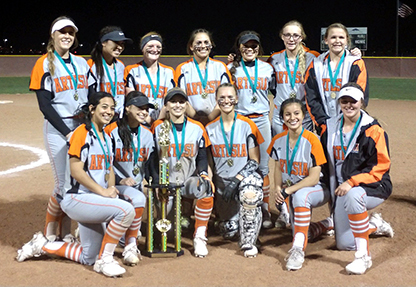 The Artesia girls kicked off their new campaign at the Southern New Mexico Softball Invitational in Las Cruces Friday and Saturday, and headed home with a record of 4-0, some solid experience, and a shiny, new trophy for their case. “I thought the girls played well,” Pulido said Saturday. “When the pressure came on, we made some mistakes, but they were all things that we’ll iron out as the season goes on. The Lady Bulldogs saw a little bit of everything over the course of the weekend, from runaway wins to nailbiters to the extra-inning showdown with Class 4A power Silver City that locked up the tourney championship. After two scoreless innings in a pitchers’ duel between Artesia senior Kali Crandall and Lady Colt junior Kamryan Trujillo, Silver was able to draw first blood in the bottom of the third when Madisson Mattie, aboard with a leadoff walk, crossed on a single by Kiana Mendoza. It took Artesia a few at-bats to answer, but when they did, they shouted their response, with third-baseman Gabrielle Gomez delivering a three-RBI triple with one away. Gomez then crossed on a stolen base amidst a throw down to first to complete a strikeout to make it 4-1 Lady ‘Dogs. After going unscathed in the home half and picking up two quick outs in the top of seven, it looked as though Artesia was poised to cruise to victory. But a Mendoza double, a single from Ajia Richard, and an error tied the game and send the title tilt into extra innings. With the International Tie-Breaker in effect, both teams left their runners stranded in the eighth, but with one out in the top of nine, Crandall belted a two-run homer over the left-field fence to put Artesia back on top, 6-4. Silver was able to bring their tie-breaker runner around from second in the bottom half on a Mendoza base hit, and a single by Richard gave the Lady Colts two on with one out. But a fly out to Kacey Thurman in center and a Crandall K ended the threat and the game. Crandall finished with eight hits allowed and six strikeouts in her nine innings of work and earned the championship game’s MVP award. Thurman was named MVP of the tournament. “We had some great showings by our pitchers this weekend,” said Pulido. “Kacey and Kali did great things in the circle, and for the most part, our defense was solid behind them. We had some great catches made in the outfield by our girls, and that’s also something we’ve been working on – getting comfortable with our range and what we can and can’t do. Artesia opened the weekend with a 9-2 win over Gadsden Friday afternoon that saw Thurman throw six innings, striking out seven. She was also 1-4 at the plate with a home run, while catcher Melody Payne went 2-4 with a two-run homer and a triple. The Lady ‘Dogs went on to best Onate that evening, 4-1, to advance to a tournament semifinal Saturday against Sandia. There, the Lady Matadors struck early with a solo home run by leadoff hitter Jayleen Burton, but the Lady Bulldogs would take control in the home half of the first on a RBI single from Crandall and a two-RBI double by Payne. Sandia cut the lead to one, 3-2, in the third, but Artesia was able to tack on a pair of insurance runs in the fourth on an error and a double-steal that saw Chanler Groves – on with a bunt single – home. The Matadors added a third run in the top of five and again the Lady ‘Dogs pulled further away, making it 7-3 on a two-RBI swat up the middle by Kamiley Marquez. But Sandia threatened once more in the sixth, plating three on Burton’s second homer of the game. Their advantage trimmed back to one, 7-6, the Lady Bulldogs were unfazed, scoring three more in the bottom of six on a Gomez two-run tater and a Payne single-turned-error. Thurman and her defense then seated the Lady Matadors in order in the top of seven to complete the 10-6 win. Artesia performed well at the plate throughout the tournament, getting key hits in key situations and using small ball to manufacture runs in between the power swats. “We’ve been working on our hitting in certain situations, facing different pitches and things like that,” said Pulido. “The girls are very comfortable with the inside pitch, and in the last few weeks, we’ve gotten them more comfortable with the outside. We had a lot of balls hit to the right side, and just their execution and moving runners over was really good. The Lady Bulldogs (4-0) will now prepare to host their home opener at 4:30 p.m. Tuesday against Alamogordo at the Mack Chase Athletic Complex, and Pulido hopes to see continued improvement from her athletes.